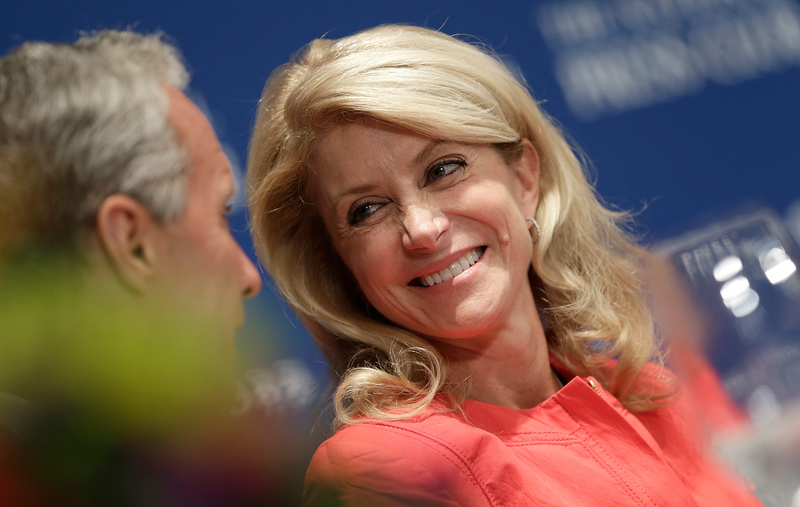 Two years after Texas Democratic Senator Wendy Davis slipped into her pink running shoes to filibuster an earlier version of the state's HB2 bill, her vision is finally coming true. The Supreme Court has ruled against the law in a 5-3 decision. Is Davis wearing her pink Mizunos in remembrance of the journey as we speak? Are they on display as a trophy of success? Though she hasn't made an appearance in the them since the much-anticipated ruling was announced, they will not be forgotten. Though they might be the cutest pair of running shoes you've ever seen, it's not about the pink sneakers. And it's certainly not about focusing more on what women wear than on what men wear. It's about what those shoes symbolize. Davis wore the famous pair of shoes with her everyday business attire to lengthen the amount of time she could stand in the Senate chamber and speak out against the restrictive abortion bill. Faced against a majority Republican Senate, however, her 11-hour-long filibuster didn't see immediate success. She discussed the ordeal with TIME in September 2014, explaining why it was so important to defend those whose voices were overshadowed by the majority. I fought that day for women, and men who love them, whose voices had been cut out of the process. In committee hearings at the state legislature, there were so many people that had signed up to speak and been told after several hours that their testimony was repetitive and they were cut off. I wanted to give voice to the people who felt like they’d not been heard. And it was those people who would later be inspired to buy the shows as a symbolic gesture. One Amazon reviewer guaranteed the shoes would serve all feminists well. The next time you have to spend 13 hours on your feet without food, water or bathroom breaks, this is the shoe for you. Guaranteed to outrun patriarchy on race day. Following the ruling, Rolling Stone asked Davis how she was planning to celebrate the ruling that made her efforts three years prior worth the struggle. She exclaimed that she's definitely popping a bottle when she arrives home. And I'll say a prayer of thanks to a God I believe in, who I believe supports us as individuals and gives us the strength and the fortitude to push forward when the stakes are high and the deck seems to be stacked against us. This reassures my faith in people, and our ability to put our heads down and fight against injustice. Keep your eyes peeled for any snapshots of her in those shoes, but don't forget what matters most: the woman wearing them and the change she inspired.